Hello everyone! Hope you are enjoying my Halloween posts. I have a charming one for you today! 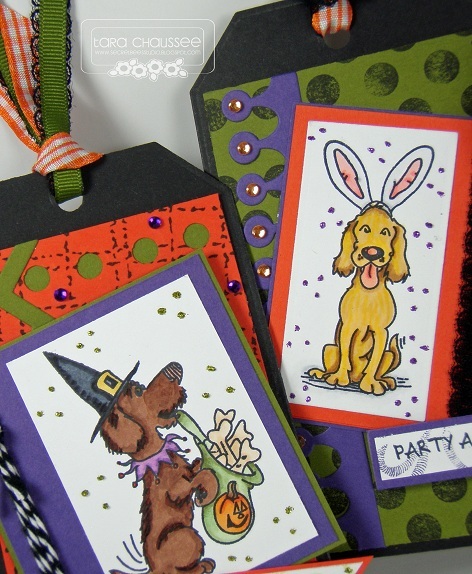 These three tags were created with one of Raisin Boats' new Halloween sets 'Canines in Costume'. We all know how people love to dress their pets up for Halloween and this set shows how amusing it can be. The sentiments in this set are so hilarious and cute and are perfect for all pet lovers. The tags themselves were cut with MFT Dienamics Tag stax and then I layered lots of Raisin Boat cardstock in bright Halloween colors with interesting borders and accents. 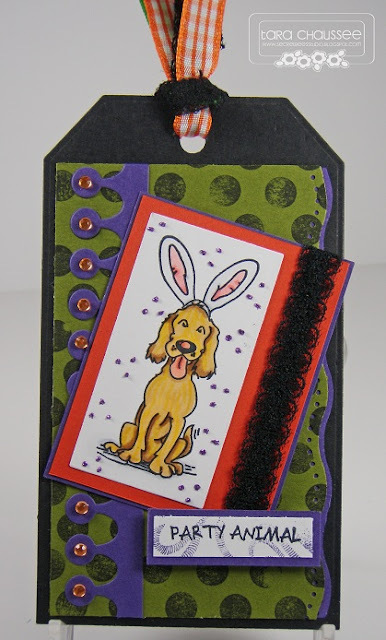 All of the costumed cuties were colored with Copic markers and accented with some Stickles polka dots. 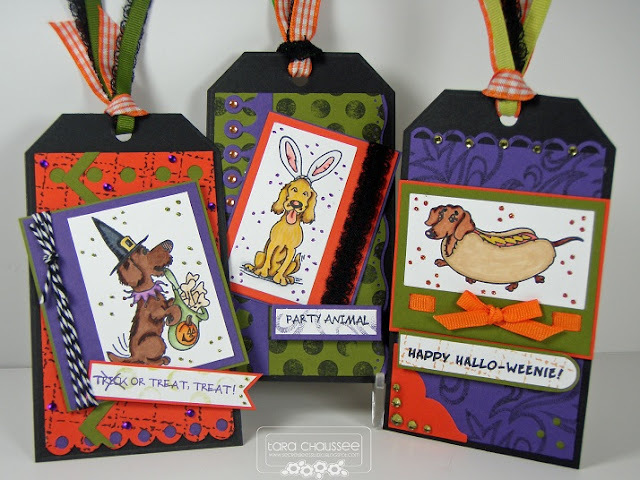 These tags would be perfect for a Halloween gift for our best friends. 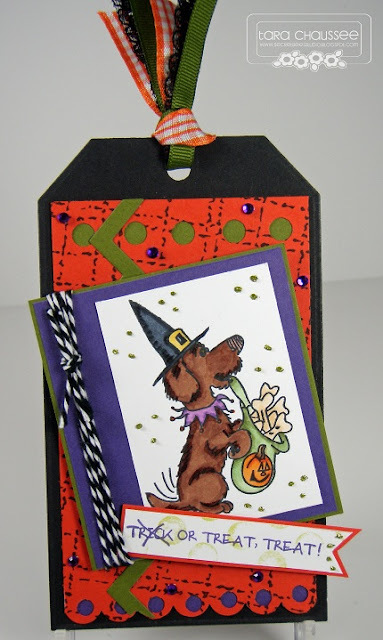 This sentiment is so sweet because we all know how dogs love their treats! 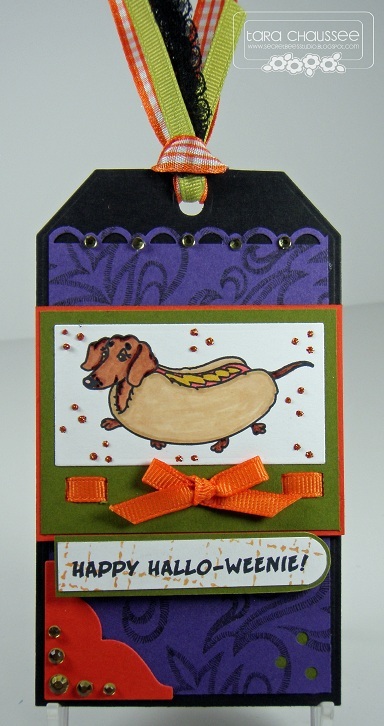 This tag features Raisin Boat twine and purple Kaisercraft gems. This adorable canine is ready for a party! I gave this one orange gems and an MFT Monarch border. This cutie is my favorite! I can just picture a real Daschund dressed like this. Too sweet and the sentiment is perfect! The Boathouse Collection ribbon is weaved through the cardstock and matches the Stickles polka dots. I wanted to let you all know that my fellow Colorado crafter, Theresa Winslow, is celebrating some big milestones over at her blog 'My Sassy Cards' and she is giving away some great prizes so we can all join in the fun! Please visit her blog for all of the details and help congratulate her on her good news!